Here is a line-up of the Tyranid Ripper models I am using for 15mm Forlorn:Hope. 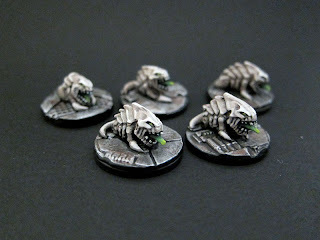 They are very easy to paint, but less easy to base and convert (in the case of the Hatchlings) which have exhausted my Greenstuff supply. I have ordered some Procreate but it hasn't shown up yet. I didn't want to do dark colored Xenos, as I expect the spaceship will end up dark and metallic and I want to be able to ID them easily during play. 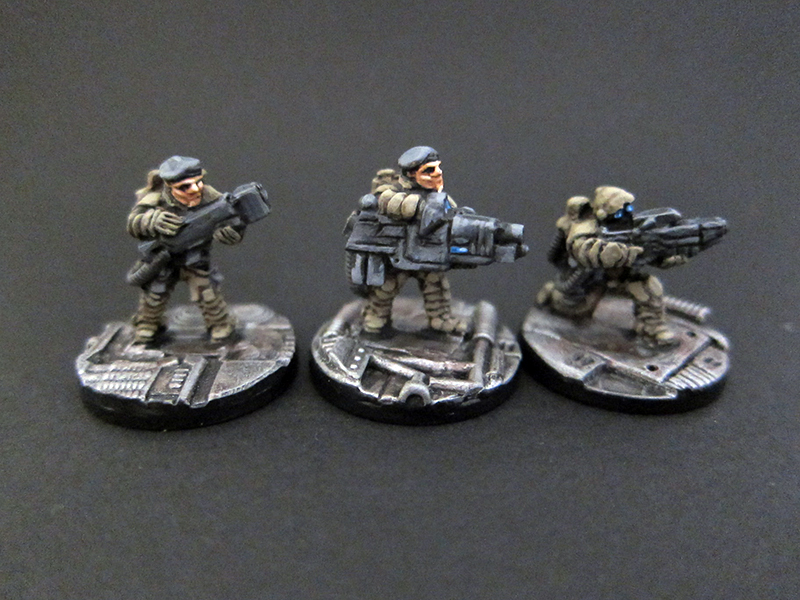 Here's a shot of them for scale with some Micropanzer SAS troopers. I've ordered some Hirst Arts Industrial edge pieces from the very helpful Mark at Tabletop Buildings NL. They are very reasonably priced and I think will help make a fantastic looking board. 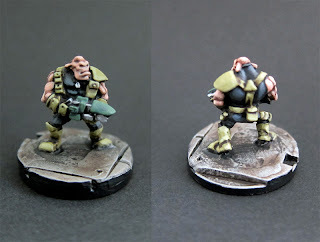 Taking a break from painting Hatchlings and Drones for Forlorn:Hope, I relaxed by painting just one of my GZG Alien mercs. I didn't want to do them as Orks or straight up Mangalores.. 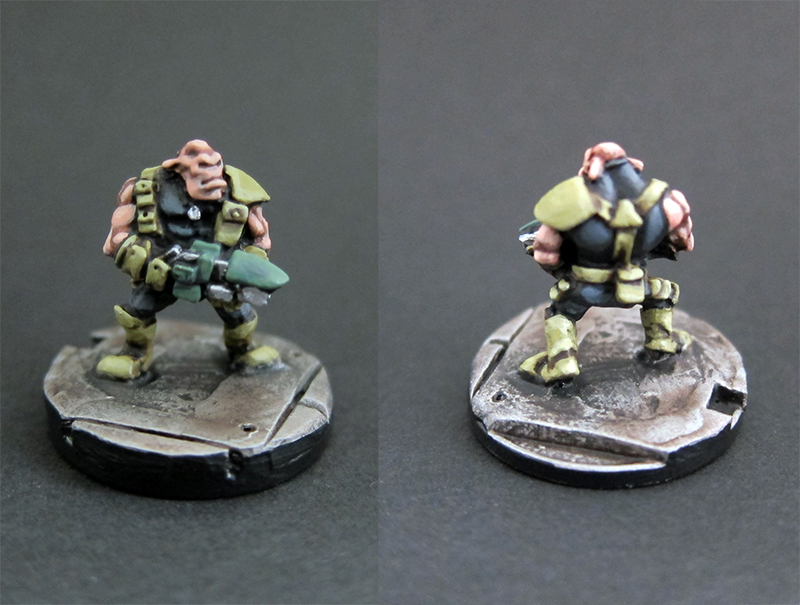 So decided on flesh tone with a uniform to fit with some of my other mercenary forces. I'm especially pleased with how the black on the back of the mini came out. The shading is nice and the tone contrasts nicely with the harness detail. To help him look less barbaric, I painted his chest as if it were wearing a vest. The base is hand sculpted as I based the model before I began press-molding them. Very nice mini to paint. Looking forward to finishing the rest! Forlorn: Hope board, Ruins themed. While trying to figure out the best way to make some 3d boards for Forlorn: Hope, I was bothered that I wouldn't be able to use my existing collection of minis as they would have the "wrong" basing. Picky, but I'm like that. So as a side project, I came up with this alternate board which is painted in the same way as my previous minis' bases. The theme is meant to be fairly generic, inspired by the 3d boards I've seen for Incursion. This board could be for horror, pulp, or just dirtside factory ruins. The irony is that I still haven't built the sci-fi version despite going on a massive deckplate-basing crusade (see last post). I have grand plans of modding the FH rules to play squad battles on the same map. For now, proxying in zombies for xenos should be fun in itself. Here are some WIP shots of building the board. Te board is mostly finished.. I think it could use some bloodstains and more decoration, and possibly model on something to represent the entry points. This has got me keen to do both the same map as a "proper" spaceship interior, and a set of post-apoc modular sections using the leftover mosaic tiles. I'm going to build the spaceship tiles out of 25mm hollow lipped square bases from em-4, with diamond plate plasticard inserts. The walls will be made of Hirst arts industrial edge pieces once I find someone to cast the bits I need. It should be fairly inexpensive in the end. Back from another Minis break..Time has been short for hobbying. 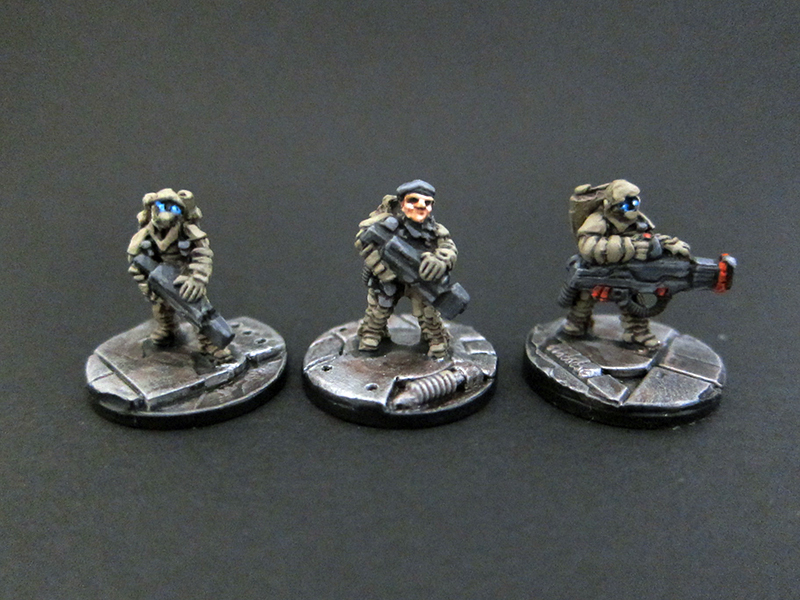 So short that I had to decline painting more stuff for Khurasan, which pains me greatly! 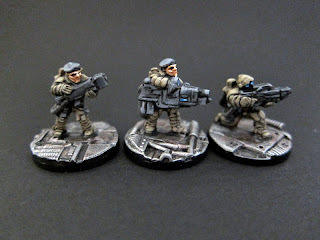 I had a couple hours during the week though, and took the opportunity to get some paint on the Micropanzer figures I was doing basing experiments with last post. 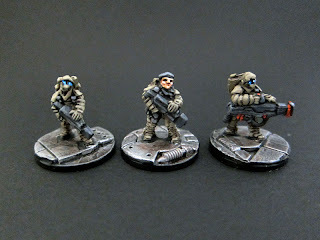 These figures are going to be used as Marines for my 3d Forlorn: Hope set. 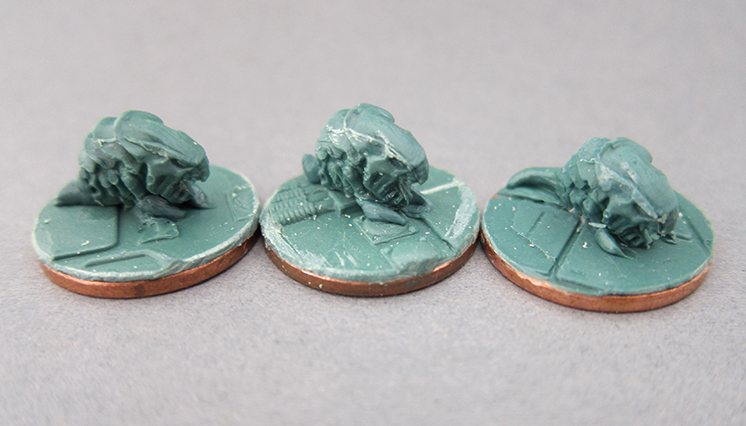 My basing experiments led me to try Oyumaru/Instant Mold to make greenstuff detail on the tops of pennies. This was a lot easier than sculpting each one individually. 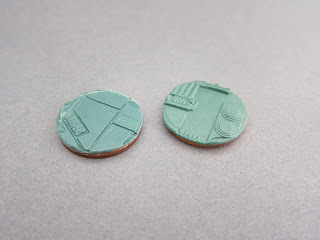 Press-molded base topper on UK Pennies. 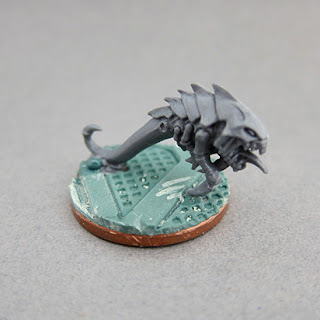 I'm using plastic Tyranid Rippers as Xenos.. Love these models. True to form, I got started on an inexpensive mosaic tile "industrial ruins" board before I settled on how to do my Spaceship themed Forlorn: Hope board. This means my newly painted minis are not based correctly for it.. Oops. I've got WIP photos of that too, but I'll save it for a complete walk-through post after I paint it.